Administrative building on Lipman Drive. Founder of Soil Microbiology (1901) - active in the field. 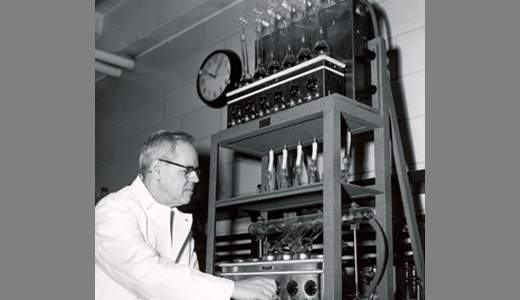 Dr. Robert Starkey assaying nitrogen content of microorganisms using Kjeldahl apparatus. Dr. Eveleigh, The Fenton-Eveleigh Chair in Applied Microbiology, inspecting lichens. 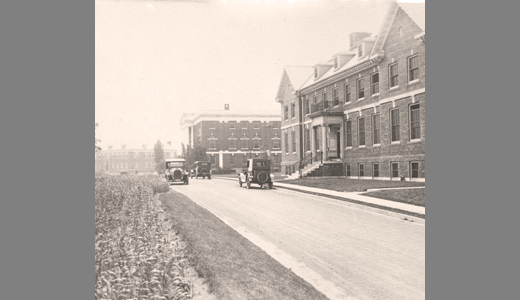 In 1863, Rutgers was designated the "State College for the Benefit of Agriculture and the Mechanic Arts" following the passage of the Morrill Land - Grant Act (1862) and soon after the New Jersey Agricultural Experiment Station (NJAES) was formed in 1880. 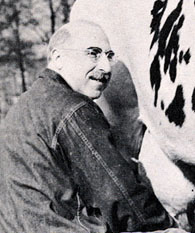 At Rutgers College in 1893, Julius Nelson clarified the nature of bovine tuberculosis, setting a trend in agricultural microbiology. Edward Voorhees and J. B. Street illuminated the role of soil bacteria in denitrification in 1902, receiving the first Nichols Gold Medal of the American Chemical Society. The introduction of soybeans as an agricultural crop in the United States, pioneered in part by the founder of NJAES, George Cook in 1879, enabled Byron Halsted to use the legumes in evaluating the efficiency of Rhizobium legume inoculants (1899). Based on Halsted's early studies, and his own concern with the role of bacteria in soil fertility, Voorhees established the Department of Soil Chemistry and Bacteriology in 1901 probably the first department of agricultural microbiology in the country and the progenitor of the current Department of Biochemistry and Microbiology. Jacob Lipman was appointed to develop the new Department in 1901 although still completing his Ph.D. in Agricultural Chemistry (Cornell, 1903). This remarkable Russian immigrant, who received his B.S. from Rutgers in 1898, gave tremendous vitality to the new science of soil bacteriology (Voorhees and Lipman, A Review of Investigations in Soil Bacteriology, 1901; Lipman and Brown; A Laboratory Guide in Soil Bacteriology, 1911). The first Rutgers Ph.D. in Bacteriology was awarded to Percy Brown in 1912. By 1915, there were six undergraduate and two graduate courses in soil bacteriology, but only one in general bacteriology. In 1916, Lipman founded the international journal Soil Science. Under the influence of Lipman, the Department achieved international status. Selman Waksman (B.S. 1915; M.S. 1916, Rutgers) was appointed to the faculty in 1918, he expanded the curriculum, embracing the study of bacteria, actinomycetes, protozoa, and fungi (S. Waksman, Principles of Soil Microbiology, 897pp, 1927), and the soil microbiology program flourished. 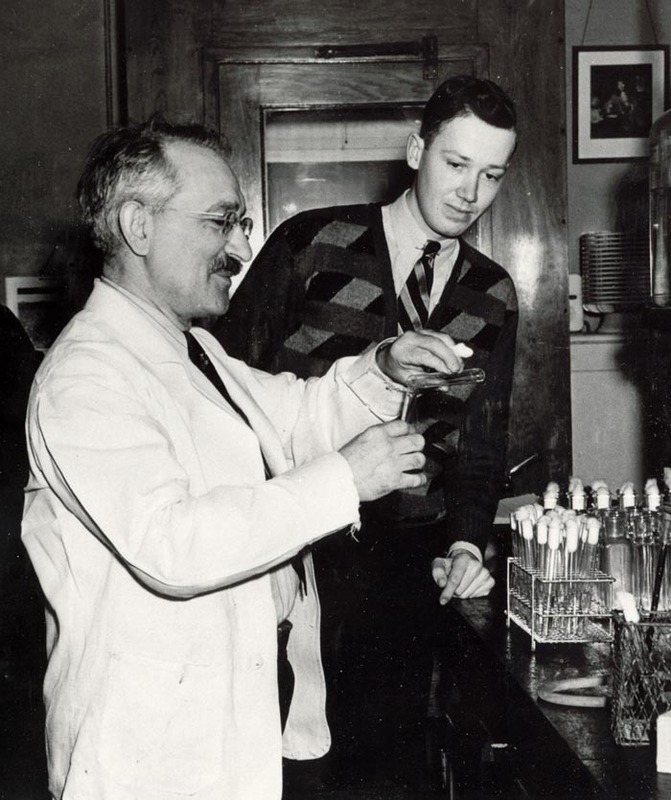 Microbial sulfur transformations were the particular focus of Dr. Robert Starkey, who, having completed his Ph.D. in 1924 under Waksman, was appointed to the Department in 1926. 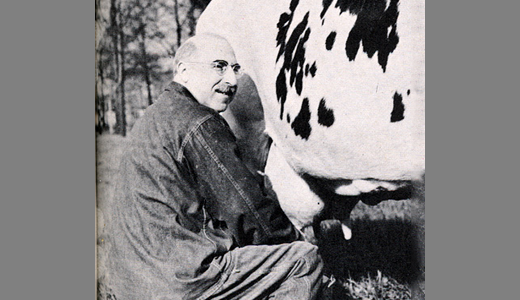 Highlights of this era (S .Waksman and R. L. Starkey, The Soil and the Microbe,1931) include the discovery of the nitrogen fixer, Azotobacter vinelandii (Jacob Lipman, 1903), Thiobacillus thiooxidans (Jacob Jaffe and Selman Waksman, 1922), microbial sulfur and nitrogen transformations (Starkey sulfate reducing bacteria and anaerobic corrosion of iron pipes, bioleaching, lipid production Lipomyces starkeyi), and early investigations of the microbial degradation of cellulose by C. E. Skinner and René Dubos (1926). Both Waksman and Starkey won national acclaim for their studies in soil microbiology. 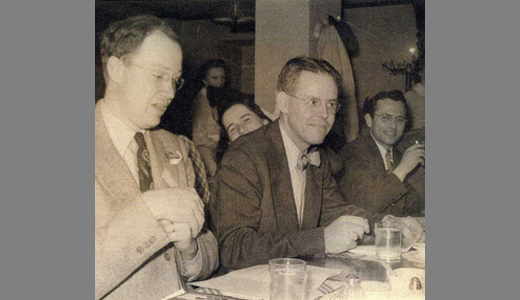 Both became President of the Society of American Bacteriology; Waksman was also elected to the National Academy of Sciences. Robert Starkey,who, having completed his Ph.D. in 1924 under Waksman, was appointed to the Department in 1926. Highlights of this era (S .Waksman and R. L. Starkey, The Soil and the Microbe,1931) include the discovery of the nitrogen fixer, Azotobacter vinelandii (Jacob Lipman, 1903), Thiobacillus thiooxidans (Jacob Jaffe and Selman Waksman, 1922), microbial sulfur and nitrogen transformations (Starkey sulfate reducing bacteria and anaerobic corrosion of iron pipes, bioleaching, lipid production Lipomyces starkeyi), and early investigations of the microbial degradation of cellulose by C. E. Skinner and René Dubos (1926). Both Waksman and Starkey won national acclaim for their studies in soil microbiology. 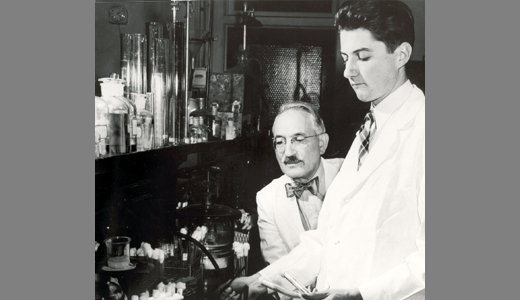 Both became President of the Society of American Bacteriology; Waksman was also elected to the National Academy of Sciences. In the late 1930s, Waksman addressed Microbial Antagonisms and Antibiotic Substances which was also the title of a book that he subsequently authored (1945). His innovative, rational screening program led to the discovery of a series of fungal and bacterial antibiotics, a noteworthy accomplishment as only two antibiotics had been previously described: penicillin (Fleming,1929) and tyrothricin (Dubos, 1939). The importance of filamentous bacteria, the Actinomyces, came into focus in this Rutgers study, andWaksman coined the genus name, Streptomyces. 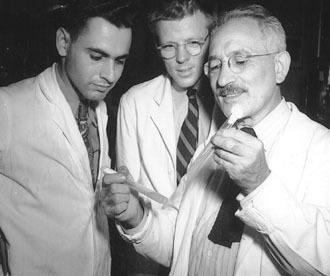 Using the screen developed by Waksman and his co-workers, several, now classic antibiotics were discovered: actinomycin A ("Actinomyces antibioticus"), Woodruff and Waksman, 1940; streptomycin (Streptomyces griseus), Schatz, Bugie and Waksman, 1944; neomycin (S. fradiae), Lechevalier and Waksman, 1949; and candicidin (S. griseus), Lechevalier et al., 1953. As streptomycin was medically significant in attacking Mycobacterium tuberculosis furthermore, it was the first antibiotic effective against gram negative bacteria its discovery set the stage for antibiotic screening programs on a world wide basis. 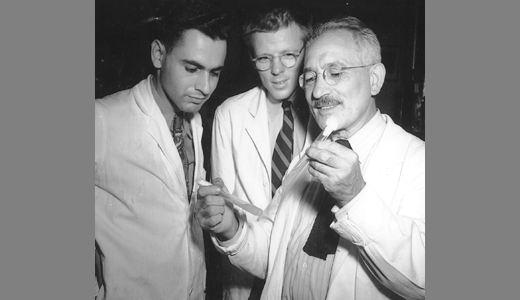 In 1952, Selman Waksman was awarded the Nobel Prize in Physiology or Medicine for his "ingenious, systematic, and successful studies of soil microbes that have led to the discovery of streptomycin, the first antibiotic remedy against tuberculosis." In 1954, after 36 dynamic years at the Agriculture School, Waksman founded the Institute of Microbiology based in large part on the antibiotic patent royalties and moved to Rutgers' new science campus (today, the Busch Campus) in Piscataway. His concept of the Institute was a "temple dedicated to the study of the smallest living things, the microbes," and he assembled a vibrant faculty to pursue those studies: Ruth Gordon (bacterial taxonomy), Vincent Groupé (virology), Hubert Lechevalier (actinomycetes), and Walter Nickerson (microbial physiology and medical mycology). During the ensuing years, The Waksman Institute's mission has shifted to encompass animal, plant and microbial developmental genetics, and structural and computational biology: The Institute is currently directed by Joachim Messing. At the School of Agriculture the Biochemistry component of the Department was formed as the Department of Agricultural Biochemistry in 1925, under Dr. Walter C. Russell, joined in 1930 by Dr. Milton Wight Taylor and later by Dr. Maclean Babcock and Gerald Litwack. Its direction was on the biochemistry of animal nutrition from its founding until the 1969 retirement of Dr. Taylor and transfer of Dr. Babcock to Food Science. A focus on protein structure and function began with the appointment of Dr. Robert Hsu (1964-1966), and Dr. David H. Strumeyer (1965-1988), and continues to this day. A leading graduate (B.S. 1936, Ph. D., 1939) is Dr. Monroe Wall, discoverer of the anticancer value of taxol. By 1951, the Microbiology Department at the School of Agriculture had expanded and moved into the new Lipman Hall, in association with the Departments of Soils and Farm Crops,. It was fitting that, 50 years after Jacob Lipman's appointment, a state-of-the-art building was dedicated to him for his pioneering accomplishments in soil microbiology. Robert Starkey, as Chair, continued to focus the department's microbiological research on agricultural, ecological and industrial projects. Indeed, the New Brunswick Scientific Company originated in part through its association with the department. 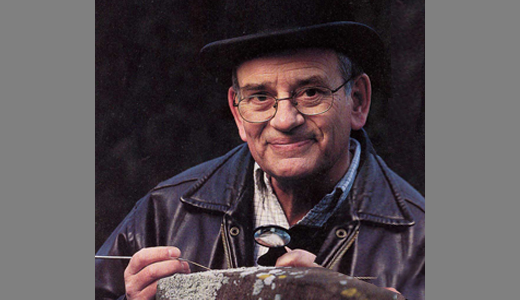 David Pramer joined the Department and addressed the ecology of microorganisms in soils and waters, and interactions of predaceous fungi and phytopathogenic nematodes (D. Pramer and H. Lechevalier, The Microbes, 1971). 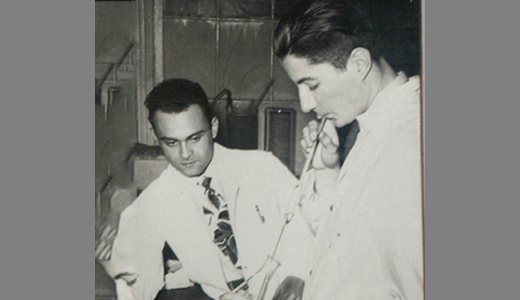 Dr. Pramer followed in the footsteps of his mentor Dr. Starkey, becoming Chair of the combined Departments -- the Department of Biochemistry and Microbiology in 1965. Pramer was later appointed Director of the Waksman Institute of Microbiology (1980) and University Associate Vice President for Research (1988). In 1965, the Departments of Agricultural Microbiology and Agricultural Biochemistry were merged to form the Department of Biochemistry and Microbiology; and for 23 years (1969-1992), the Plant Physiology section of the Plant Biology Department was also united with the Department, only recently rejoining the newly reorganized Department of Plant Science. In 1969, James Macmillan (1965 -1997) succeeded Pramer as the Departmental Chair. With Llonas Miller, Macmillan characterized and assessed the role of microbial pectinases and yeast lytic enzymes, developed larger scale production of monoclonal antibodies and later characterized Bacillus toxins. Stanley Katz who had joined the Department (1971) from Agricultural Chemistry, was appointed Chair in 1979. He studied the incidence of antibiotic residues in agricultural products, developing key analytical techniques that clarified the nature and breadth of the problem. In addition he assessed the biological significance of antibiotic/antimicrobial and pesticide residues in foods of animal origin. Other recent microbiologists of the Department include Richard Bartha (1964-1998) and Anna-Louise Reysenbach (1993-1998). Bartha spent several decades unraveling the role of microbes in the detoxification of pesticides, hydrocarbons and noxious chemicals both in soil and marine environments (R. Bartha and R. Atlas; Microbial Ecology, 1981). Reysenbach probed hydrothermal vents, both ocean depths and terrestrial domains, in assessing the diversity and origin of both Archaea and Bacteria. Today, the Department of Biochemistry and Microbiology continues with a broad ecological and applied microbiology program under the guidance of Dr. Max Häggblom (see faculty list). Relationships with the Departments of Plant Science, Plant Pathology, Environmental Sciences, Food Science, The Institute of Marine and Coastal Studies. Lechevalier, H. 1982. 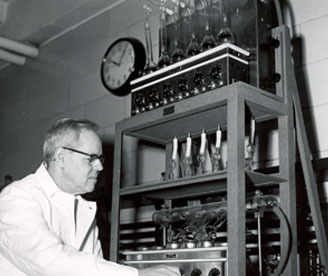 The Development of Applied Microbiology at Rutgers. Waksman Institute of Microbiology, New Brunswick, NJ. Lipman, J.G. 1921. 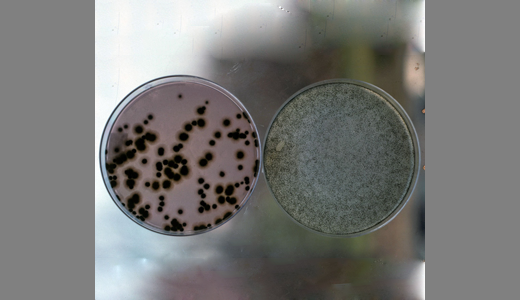 Bacteria in relation to country life. Macmillan Co., New York, NY. New Jersey Agricultural Experiment Station. 1952. Lipman Hall - dedication June 12th, 1951. Vail-Ballou Press, Binghampton, NY. Tedrow, J.C.F. 1995. History of Soil Science at Rutgers University 1970-1990. Dept. of Natural Resources, Cook College/New Jersey Agriculture Experiment Station, New Brunswick, N.J.
Waller, I.N. 1955. Where there is vision. The New Jersey Agricultural Experiment Station, 1880- 1955. Rutgers University Press, New Brunswick, NJ. Woodruff, H.B. 1980. Soil Microbiology at the New Jersey Agricultural Experiment Station and in Industry. 4th Selman A. Waksman Memorial Lecture. pub. New Jersey Experiment Station, New Brunswick, NJ. Woodward, C. R. 1927. The Development of Agriculture in New Jersey. 1640-1880. pub. The New Jersey Agricultural Experiment Station, New Brunswick, NJ. Woodward, C. R. and I.N. Waller. 1932. New Jersey's Agricultural Experiment Station. 1880- 1930. pub. The New Jersey Agricultural Experiment Station, New Brunswick, NJ.